Azerbaijan and Germany have established versatile cooperation in the field of energy and there are all possibilities for expanding this cooperation. This was stated by Deputy Minister of Energy of Azerbaijan Natig Abbasov during the German-Azerbaijani business forum on energy and ICT. "As you know, the Uniper company is one of the buyers of Azerbaijani gas in the framework of the Shah Deniz-2 project. The recently signed new agreement in the field of oil and gas production, energy efficiency, use of new technologies, optimization of energy consumption and reduction of carbon emissions will contribute to the development of this sphere in Azerbaijan," he said. Abbasov went on to say that the SOCAR-Uniper joint venture operating from 2016 is conducting modernization based on German technologies at the Azerkimya Production Union’s enterprises. 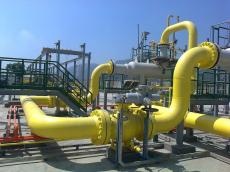 "There are great opportunities for Uniper company to participate in the project of modernization and reconstruction of the gas distribution network in Baku city and Absheron peninsula, reduction of losses, use, optimization and management of power stations," he added. Baku hosted German-Azerbaijani Business Forum 2018 on Energy and ICT on October 9. The forum is attended by officials of ministries and agencies of Azerbaijan, the German Embassy in Azerbaijan, Azerbaijan’s state oil company SOCAR, the European Bank for Reconstruction and Development (EBRD), BP, Siemens SC, SAP, Lahmeyer International GmbH, DHL Global Forwarding, PASHA Bank, etc. Presently, more than 200 companies with German capital operate in Azerbaijan. In January-August 2018, Azerbaijan’s trade turnover with Germany exceeded $1.05 billion, according to Azerbaijan’s State Customs Committee. Exports of Azerbaijani products for the period to Germany exceeded $619.5 million. Germany is the fourth biggest foreign trade partner of Azerbaijan. Diplomatic relations between Azerbaijan and Germany were established in February 1992. There was an exchange of embassies in the same year. Azerbaijani embassy in Germany was one of the first diplomatic missions of the Republic abroad, whereas Germany has become one of the first European states to support Azerbaijan during the Karabakh war, and recognize its territorial integrity.